Peaches have been grown since the prehistoric ages and were first cultivated in China. They are considered a Chinese symbol of immortality and friendship. Before arriving in Europe, peaches were grown in Persia. The Romans believed that peaches came from Persia and called them Persian (Iranian) apples. 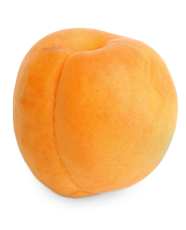 The name peach comes from the Latin word for Persian - prunus persica. Peaches grow best in warm, temperate climates. The Niagara Fruit Belt produces 90% of Ontario’s tender fruit crop. The Niagara Fruit Belt is about 65 kilometres, mainly below the Niagara Escarpment along the south shore of Lake Ontario, extending from Hamilton to Niagara-on-the-Lake. It is one of the richest fruit-producing areas in Canada. Close relatives of almonds, peach seeds are used as an almond oil substitute in cosmetic preparations. The leaves and bark of peach trees are used as a medicinal tea for chronic bronchitis, coughs and gastritis. The Famous French painter, Renoir, encouraged students to improve their painting skills by reproducing the textures and colours of peaches. In 1779, peaches were harvested at the mouth of the Niagara River for local consumption. In the mid-1780s, Peter Secord, the uncle of Laura Secord, was believed to be the first Loyalist farmer, taking a land grant near Niagara to plant fruit trees. Ontario peaches, pears and plums have been thriving in the area ever since. In 1792, Lady Simcoe, wife of the King's representative for British North America, wrote in her diary that she had 3 standard peach trees that helped provide her with treats over the winter. In 1865, the price of a bushel of Crawford peaches was $4.00 (poorer varieties from $2-$3.00); pears cost $1.50 - $2.00 a bushel; and plums cost $3 - $4.00 a bushel. By 1875, there were 375,000 peach trees in Ontario (not one of those varieties remains today). In 1930, local pilots flew Yellow Sun peaches via Montreal to England for the Prince of Wales.